Along with old and abandoned houses, my other passion is the forest. It is a passion I am rediscovering as I wander through the archive of some of my earlier work on this cold and snowy winter afternoon. I live in an area that is primarily made up of trees, rocks, rivers and lakes. Nothing is as healing as the smell of the Muskoka forests at any time of year. One of my favourite places to hike in all seasons is at Hardy Lake Provincial Park. The Park has a series of trails that meander through some beautiful bush and some challenging terrain. Every trail either follows a lake shore or ends up opening up onto to a lake. The most difficult trail goes up and down rocky ravines, past marshes and the reward is a small point of land in a hidden bay of Lake Muskoka. I had a wonderful meeting with a barred owl back in there. He seemed as curious about me as I was about him. My favourite trail circumnavigates Hardy Lake and there is the foundation of an old homestead on the far side. Just a few minutes past the homestead and a good hour in, there is a magical section of forest that seems a little different than the rest. It feels more lush, more closed, like as if you have entered another world. This is the place that inspired some of my earliest paintings, including the two in this post. 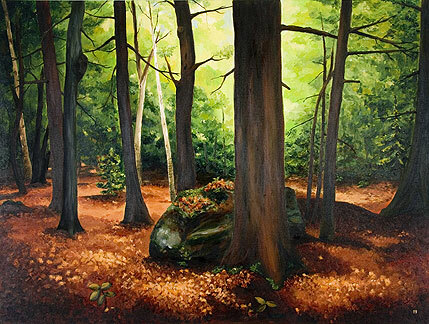 “Trailside” (above) grabbed “Best in Show” with the local arts group in 2005. I have been spending a lot of the last two years wandering though the farms that pop out of this rich forest. I believe the time has come to go back into the magical and mysterious place that darkens the edges of the old farms once again. I had a remarkable series of animal, insect and bird encounters on another one of my favourite trails a few years ago. There is one more of my early “forest” paintings and the story of the adventure on the “Explorations” blog. Robin – if you read this… I know you will appreciate it! I LOVE “Whispers of Autumn.” Just stunning! To me, there’s nothing more wonderful than the woods. Not just for the animals & peace & quiet, but for the trees & the light & the smell & the feel. Over time, trees become friends, too. I’ve been thinking that I want to do more forest paintings, even though I know I’ll never fully convey all they are to me. 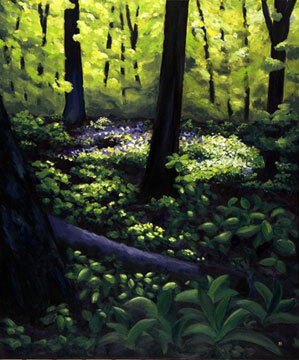 The blue reminds me of ‘Bluebell Woods’ in my hometown of Durham…It adds cool and the mystery to the scene. The sunlight amongst the trees and just touching on the forest floor gives me that feeling I love when I go walking. The light! The light! You really do capture and follow the light in your artwork! These are gorgeous, and I’m with you on the woods. I really really love the colors and light in the first painting. Wonderful work Michelle !